With the help of Ocusweep tests, information is obtained about the functioning of the whole visual system – from the ability of the eye to see to the efficiency of the brain to process visual information and the accuracy of eye movements. Please read our documentation below for a deeper insight of the product and why you need it. Visual acuity measurement verifies that the narrow optical path to posterior part of the eye is clear and the small sharp-vision area or fovea is functioning. Ocusweep time-limited visual acuity test measures sight for both near and far distances. The test, which registers the patient’s button press answers to the visual task, is quick and very repeatable. Visual acuity is affected mainly by refraction errors, macular diseases and ocular media opacities like cataract, and near vision by outdated or missing reading glasses. Contrast vision measurement reveals the ability of the structures of the eye to detect differences in brightness. This is necessary e.g. in identifying faces and seeing in low light levels, when lighting is shadowless. Contrast vision can be compromised by eye diseases like cataract, glaucoma or diabetes even if visual acuity remains good. Ocusweep measures contrast vision with sine wave gratings at 1 cycles/degree. Contrary to visual acuity testing, outdated or missing eyeglasses don’t usually affect test results. Contrast vision may be reduced e.g. by cataract, diabetic macular oedema or age related macular degeneration (AMD). Poor contrast vision increases the risk for motor vehicle accidents when driving. Visual field examination measures how the eye, ocular fundus, optic nerve and the brain can perceive different areas of the visual field. Intact visual field is needed for good visual ability. Defect in the visual field can be caused e.g. by diseases of the posterior part of the, glaucoma or brain tumour. 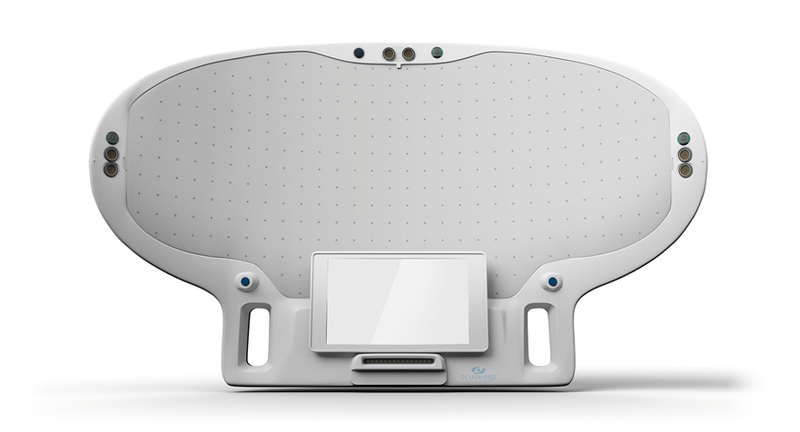 Ocusweep measures visual field in normal room light. The device adapts to ambient light levels by using light sensors. Therefore there is no need for separate dark examination room. A fixed head rest is not needed because the viewing distance is controlled by ultrasonic sensors and speech synthesis. Visual field examination can be done up to 90° left or right and 36° up or down. Examination can be done with both eyes open or with one eye only. Ocusweep SAP (Standard Automated Perimetry) visual field test conforms to the same international standard as other commonly used perimeters (International Standard ISO 12866: Ophthalmic Instruments – Perimeters). Visual field defects can be a caused by a disorder in visual neural pathways (e.g. a stroke: usually homonymous defects i.e. similar defect in both eyes) or in the eye (glaucoma; retinal detachment; retinal diseases). Reaction time field measures, in addition to visual field, the speed of your vision and your reactions towards objects in the visual field. Our visual perception is based on agile and precisely controlled eye movements. Ocusweep RTP test is a novel method for assessing visual processing speed by recording the button press responses of the test person in visual multi-fixation task. Ocusweep RTP test stimulates the fundamental function of the human visual system to move the eyes towards an object perceived in the visual field. Good results in the test require good attention, oculomotor function and a normal visual field. It is an excellent choice when an overview of the functioning of the whole visual system is needed.